(Nanowerk News) Scientists at the University of the West of England are to design the first ever biological robot using mold. Researchers have received a Leverhulme Trust grant worth £228,000 to develop the amorphous non-silicon biological robot, plasmobot, using plasmodium, the vegetative stage of the slime mold Physarum polycephalum, a commonly occurring mold which lives in forests, gardens and most damp places in the UK. The Leverhulme Trust funded research project aims to design the first every fully biological (no silicon components) amorphous massively-parallel robot. 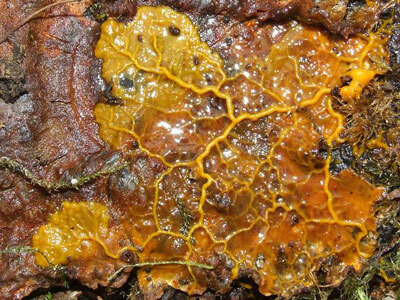 The slime mold Physarum polycephalum. This project is at the forefront of research into unconventional computing. Professor Andy Adamatzky, who is leading the project, says their previous research has already proved the ability of the mold to have computational abilities. Professor Adamatzky explains, “Most people's idea of a computer is a piece of hardware with software designed to carry out specific tasks. This mold, or plasmodium, is a naturally occurring substance with its own embedded intelligence. It propagates and searches for sources of nutrients and when it finds such sources it branches out in a series of veins of protoplasm. The plasmodium is capable of solving complex computational tasks, such as the shortest path between points and other logical calculations. Through previous experiments we have already demonstrated the ability of this mold to transport objects. By feeding it oat flakes, it grows tubes which oscillate and make it move in a certain direction carrying objects with it. We can also use light or chemical stimuli to make it grow in a certain direction. This research will lay the groundwork for further investigations into the ways in which this mold can be harnessed for its powerful computational abilities. Professor Adamatzky has recently edited and had published by Springer, 'Artificial Life Models in Hardware' aimed at students and researchers of robotics. The book focuses on the design and real-world implementation of artificial life robotic devices and covers a range of hopping, climbing, swimming robots, neural networks and slime mold and chemical brains.